Crock Pot Grain Free Low Carb Granola made sugar free as well! 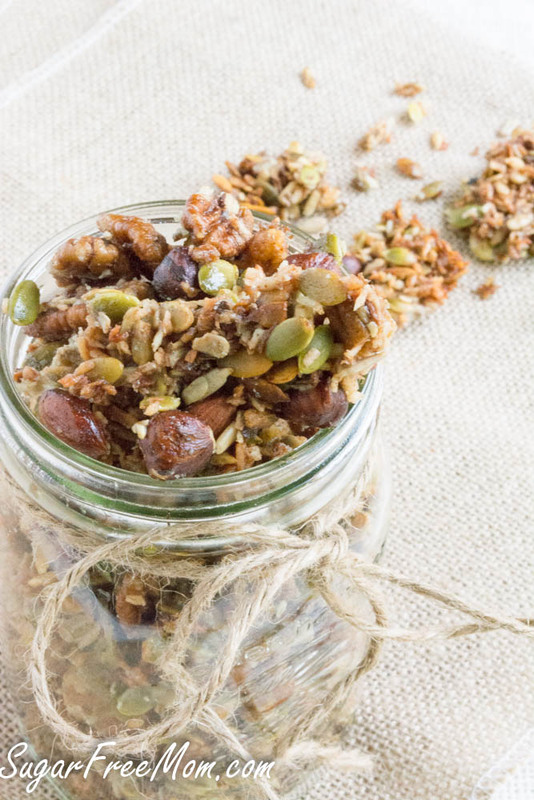 Here’s a crunchy snack that’s made easily in your crock pot and perfect for an on-the-go treat! 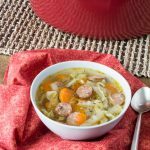 This recipe was first published in September of 2015. I decided a nice new video to show how easy it is to make was needed so I’m reposting it today. Slow cooking makes my life so much better as a busy momma. Dump in the ingredients and be on my way to do other things is why I love my crock pot! I recently bought a new one by Hamilton that has 3 different settings. If you choose timer you can make sure your food stops cooking when it hits a certain temperature so there’s no need of worrying about anything overcooking and drying out. While my boys do have nut allergies my hubby, myself and my daughter do not. 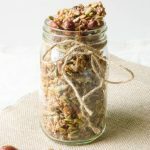 I make plenty of yummy snacks that are nut free for them but sometimes hubby, daughter and I really want some nutty granola. This was one of those times the hubby mentioned I haven’t made anything with nuts for him. And I had plenty of other recipes I was working on so that why’s the crock pot came to mind immediately to make life easier. Once cooked in the crock pot you lay it out on a baking sheet and let it cool. It hardens nicely then you can store it as you like. It was only the three of us eating it, but within a few days, it was gone. Hubby especially loves it! 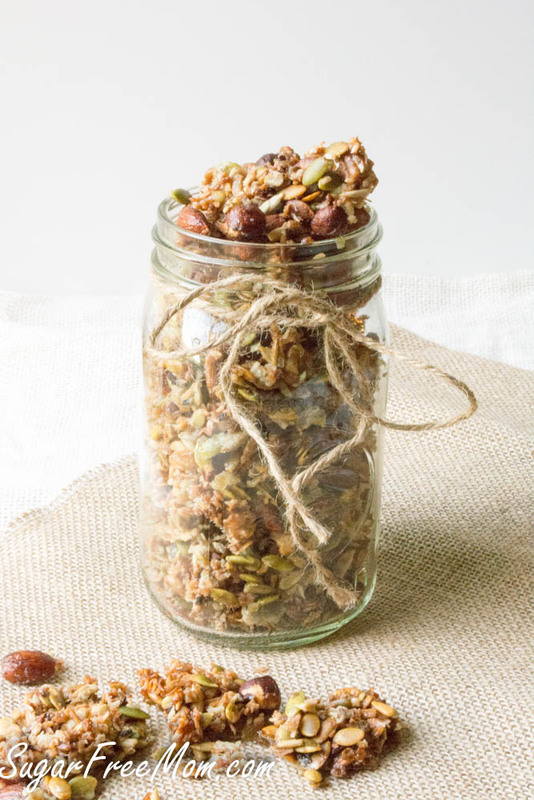 Place your yummy granola in a mason jar and cover or make individual little baggies up for the kids in the cupboard when they want a snack to grab! UPDATE: After reading several comments that many people were getting burned granola, I’ve adjusted the temperature from high in orginial recipe to low, still works great but all crock pots are different and some heat better than others. On low this may take you longer than 2 hours to get them toasted. Turn Crock Pot to low and add coconut oil and allow it to melt. Once melted add vanilla extract and stevia. Stir well before adding nuts, seeds and coconut. Stir the granola mixture well to make sure all is coated. Whisk Swerve, cinnamon and salt together then sprinkle over the nut and seed mixture. Cover and cook on low 2 hours or until you can smell them and they appear browned and toasted. Pour and spread out onto a baking pan to cool and/or refrigerate. Keep stored in a covered container. 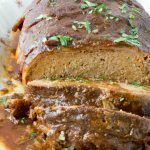 great recipe, I’ve never done it in the crock pot.Its genius! Love your recipes. I love being sugar-free! Sounds yummy – but we have coconut allergies here. Another oil you would suggest? Thanks! I LOVE pumpkin seeds! This combo sounds so amazing and I have all the ingredients in the pantry. Your recipes are so awesome, thanks so much! I just made this today and it smells so goooood. I love it’s grain free and sugar free. Mine never dried when I spread it out and I left it for quite awhile. Any ideas? Probably because it’s still pretty warm out, you could pop it in the fridge for a bit to harden. Is it 2 cup sunflower seeds and 1 cup pumpkin for a total of 3 cups of seeds? I just updated it to say “each”, so total is just 2 cups. Sorry and thanks ! please continue to share sugar-free, grain-free recipes for those of us on Wheat Belly. 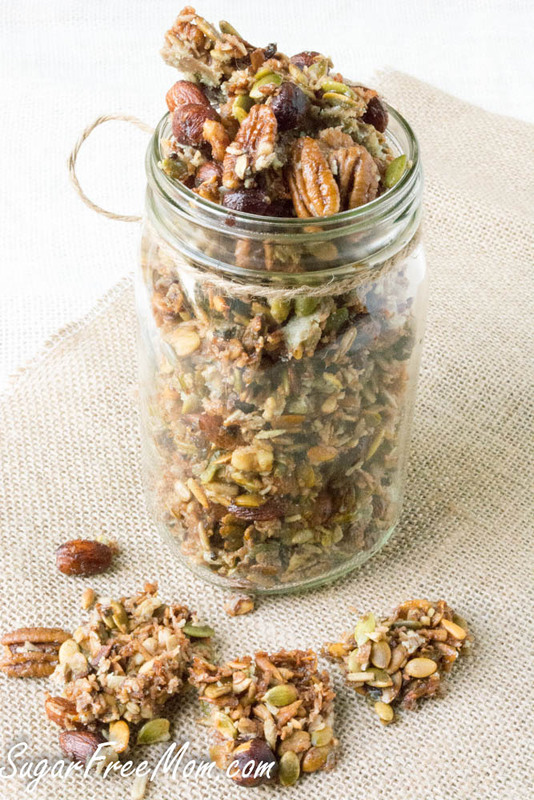 I will make this today…have missed granola!! Thank you! Wouldn’t it only work with Swerve? Something like Splenda wouldn’t set up, would it? That’s a good question, I’m not sure but I think since the Swerve is granulated like the Splenda I think it will be fine. It’s the coconut oil that can firm it up, just put the mixture in the fridge after it comes out of the crock pot. Anyone ever try this without the Swerve? I’ve tried stevia and didn’t care for it so I’m afraid to put any of the sweeteners on this. Wondering if it would set up even slightly without any sweetener. Thanks!! I just made it with Splenda. It is not setting up like I think it should. Tastes great, but it does not harden to look like the pictures. Try placing it in the fridge for a few hours. Maybe try an egg white? Sweetener may still be required? I know when we made sugar coated nuts for holidays it requires an egg white/meringue whipped? Just a suggestion though? I dont know. Love this site tho! So excellent ! This recipe is on constant repeat at my house now. Sooooo delish, almost too good. I can’t stop eating it once I start. Easy and delish and satisfying. We eat it like cereal with milk or on yogurt or just plain. Just love it. Awesome! Us too, I make it on Sundays, gone before I the week is over! I just wanted to tell you how amazing, awesome and delicious this recipe is. I’ve literally been eating it for 2 weeks straight with some unsweetened coconut milk yogurt or just unsweetened almond milk. It feels like I’m eating cereal again thank you thank you! 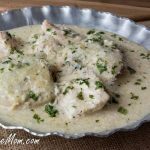 I always triple this recipe and store the extra in the freezer and it holds up very well in there. So excited to have something as scrumptious as this to add to the breakfast menu! So happy you like it, we so love it too! Do you cook it for any extra when you triple it? I doubled it and it’s cooking right now. I don’t think you need to. I don’t know what swerve is, Is it possible to use raw honey instead? Thank you for the recipe it looks amazing. Swerve is a sugar-free sweetener but yes of course you could sub honey. Wow Shannon, you are such an inspiration making recipes for the family and not even being able to enjoy them. Great substitutions! Yes vanilla liquid stevia is stevia with a hint of vanilla flavoring added. Do I have to use vanilla stevia or could I skip it? I will look into it, not sure but I will find out how to fix that. I was told by my web designer that there should be an Unsubscribe somewhere on the bottom of the email notifications you are receiving. 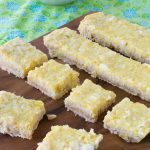 Does the shredded coconut provide a lot of texture? I don’t typically enjoy coconut (mostly it’s texture though) — wondering how big of a deal it would be to leave it out. don’t think you will even notice it in there among all the nuts. What program do you use to calculate the nutrition information? I use myfooddiary.com and it’s $9.00 a month. I made this a few days ago after my husband said he was craving a moist granola, similar to one he had at a San Antonio restaurant one time. Nothing in the stores seemed to fit the bill. They are all so dry. 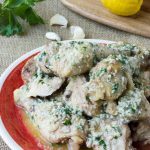 So when I came across this recipe which was low carb, for me, I thought I would give it a try. Success! He loves it! I used splenda since that is what I had on hand and, like someone else commented, it didn’t totally clump together like the pictures. But the flavor is amazing. I will try putting it in the fridge next time for sure. I also couldn’t find vanilla stevia in my area so I used a pinch more vanilla extract with regular stevia. Thanks Brenda! Glad you and hubby liked it! Could you put this on a cookie sheet in a low oven instead of the crockpot? I’m sure you could but very low maybe 300 F and watch closely. Looks amazing but does it not burn on ‘high’ for hours? Do you have any substitution suggestion for the stevia? Just use more Swerve sweetener or your favorite sugar free sweetener and leave the stevia out if you don’t like it. What can I sub for the liquid Stevie? Personally not a big fan of the taste. Also, I noticed you use coconut oil in most thinks, is there a sub for that that would work just as well? Everything looks good. Any other oil can be subbed for coconut oil, avocado, olive, etc. 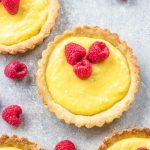 Use whatever sugar free sweetener you prefer in this recipe, it’s easy enough to add just a small amount, taste and adjust it. Made a double batch of this because I wanted to give some to a fiend who just got out of the hospital. What a mistake! It’s an oily disgusting mess. Trying to figure out how to salvage all those expensive nuts. Did you happen to use salted nuts? This recipe requires raw nuts. Also after it comes out of the crockpot it needs to cool before storing. /you can speed up the process by placing it on a baking sheet and refrigerating. It will harden into clusters. I have just made it using cooked salted nuts and it is sooooo good. I also added way more coconut oil than the recipe. Thank you so much for the recipe. I used to think this too. But the carbohydrates vary between brands of anything. My pumpkin seeds i use now are 17grams carb per 100gms. Much better than the previous ones. Not sure what took me so long to try this recipe BUT glad I finally did! Very yummy!! Just tried cooking this…followed the recipe exactly. Stirred after first 30 minutes. Close to the second 30 I smelled something burning. The nuts had started burning on the bottom. Wondering if it would work on low, stirring ever 30 minutes for 2 hours? Hi. I love this granola and have it every day on my yogurt. I’ve analyzed the recipe with a few sites to see the carb content and the lowest I get is 19gm / serving (myfitnesspal.com). Not sure what I’m doing wrong… I’m using raw unsalted nuts and seeds from Whole Foods, as well as Swerve and the other specific ingredients. Could you please post the link for the site you use for analysis or provide any insight. Thanks so much. I don’t have Swerve into my totals because it has little to no effect on blood sugar. I use My Food Diary site and I pay a fee monthly for accurate info. I will also double check mine. Not counting the Swerve accounts for the discrepancy! When I don’t count the Swerve, I get 9gm / serving. I wasn’t aware that Swerve doesn’t affect blood sugar… I must do some more reading. Thanks Brenda! I think my slow cooker must cook hot as I just made this and I did stir every 30 minutes and it got quite burnt. I’m hoping that I can rescue it. Any suggestions for next time? I made it per directions stirring every 30 minutes snd it is very dark and burnt and wet. It does necessairly taste burnt, and i will try putting it in fridge to see if it will dry up any. 2 hours definitely too long – my batch burned, and I followed instructions exactly – smelled great while it was cooking, so we’re very disappointed! I will try again but probably reduce the cooking time by half. I’ve made this in two different crock pots I have. The recipe began in one of my older ones, and I have a new one now which heats up much stronger than the old one and really holds the heat. It super powerful so after 1 hour, mine seemed done, but the old crock pot needed another hour. So if it seems they are cooked enough take them out to set on the baking pan after 1 hour. Mine also burnt, I could smell that it started browning after the first hour so I switched to mixing every 15 minutes but it still tastes really burnt and everything became pretty uniformly brown. Really bummed. Hopefully next time an hour will be enough. I believe I commented on this when I found it sometime last year. Have to come back and thank you once again. So loving this recipe, Can’t Get Enough. Was talked into buying a bag of low carb cereal on Amazon. Paid. $20 for a one pound bag. Was kicking myself when I tasted it and it was exactly the same recipe. Quickly went to nuts.com. for all the nut ingredients paid about $55. I think I have enough to make it least six bags. I will never stray from this recipe again. Loving it so much! Oh and I forgot to say. 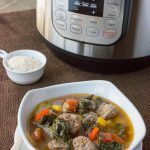 Works perfect in the instant pot! I’m going to post it on the instant pot Community with a link to your site. Can you share the instant -pot instructions, please? Sorry I’ve not made it in the instant-pot. I think that is a good idea, right before adding it to the fridge. When sprinkling the swerve mixture on top, do you stir it in? I would love to make this but don’t have a crock pot. Can I make it in the oven or on the stove top? Yes you could bake it at 325 degreed F for about an hour, stirring half way through. Hi, I am German, and I made this wonderful receipt – but I used cashew instead of pecans and I made it in the oven with 150° Celsius (how long depend of the oven, I think it was 10-15 minutes with turning in between. And I used less sweetener because we no longer like things too sweet. I have a Crock Pot but for such recipes the time in the oven is quicker. 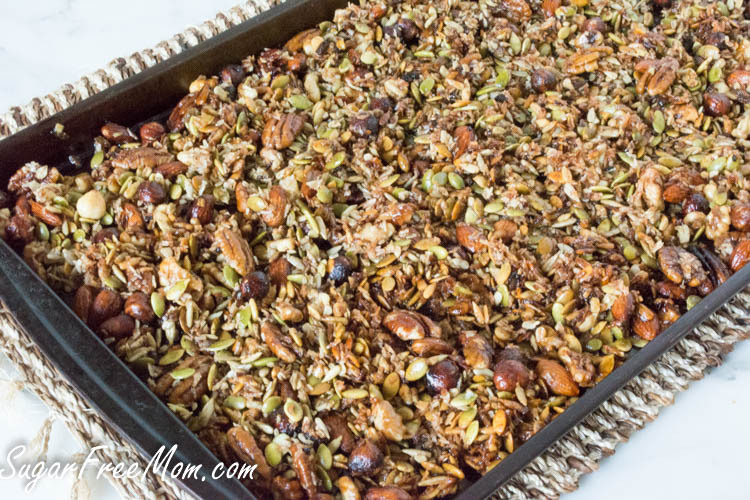 The whole family liked this Granola recipe, and I have to do it more often. 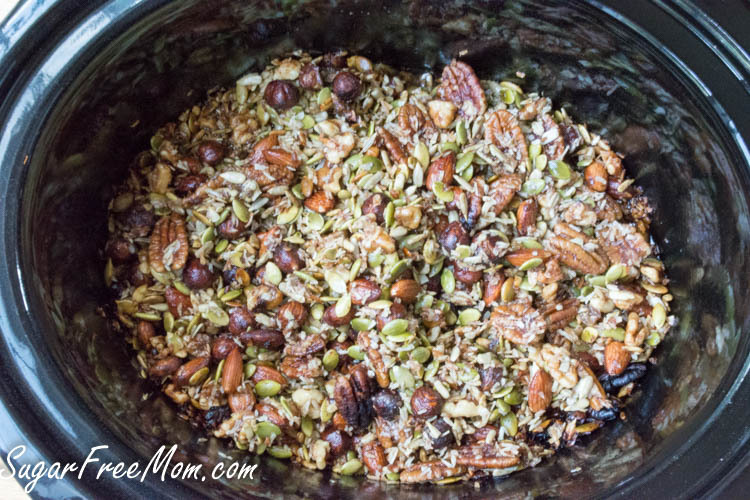 Granola in a crockpot! Life changing, just found this on pinterest and repining! I don’t care for sunflower seeds would there we a good low carb alternative. Thank you, this looks yummy. Just use more nuts you like. Thanks, you mentioned MyFoodDiary.com and was wondering if it calculates net carbs for you? No it doesn’t, I do that myself. super tasty, but mine was a bit oily. Not sure what I did wrong. Any suggestions? I’m a low-carber, and love your recipes. 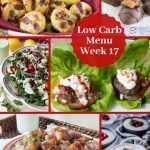 Some of the carb counts make me cringe because I can’t figure out the net carbs. Would it be possible to add fiber counts to your Nutrition info. for us keto folks? Fiber count is included in every single recipe on my site. Both are in this recipe above. Subtracting that from total carbs = net carbs. Often I have the net carbs listed under the notes of the recipe. Net carbs for this recipe is 4.8. This was very, very good. I followed the instructions to stir every 30 minutes, but didn’t keep track of total time…I think it took longer in my crockpot than 2 hours, but I just stopped the cooking when the nuts looked toasted. It certainly was very crisp with great clusters! Just read your recipe and I could just weep, ty for this, I’ve been dying for something crunchy and delicious with that salty sweetness that i love but without the BAD, u truly r a life saver! Brenda, I like this recipe, and usually make it in a doubled batch. However, could you come up with a recipe to make it spicy and salty? I’m needing a salty snack! I will work on it!! did you use swerve granular or swerve confectionary for he sweetner? cant wait to try this! Either will work, I’ve tried both but the granular actually makes nice clusters. I made this today, YUM….but its so warm out i have to store it in the fridge because the coconut oil gets melty when i leave it out. Anyone else? I am new to carb free/ sugar free dieting so apologize for any silly questions. I am allergic to any artificial sweeteners . What should I leave out of this recipe and/or should I substitute? Can you also recommend substitutes? Thanks so much. I make this several times a month. Just started making a dark chocolate base, on a cookie sheet, and then put the warm nut mixture on top, sprinkle some sugar free chocolate chips on top and then put the whole thing in the freezer to cool. I store it in the refrigerator in plastic containers. It makes it easier for me to carry to work for my lunches and snacks. I don’t have a crockpot. Can this be made in the oven or on the stove? Yes, 350 degrees F about 15 minutes, turn them over a bit and then another 10 minutes, maybe longer so just keep checking on them so they don’t burn. Looks really yummy….and simple enough to prepare. How long can this keep for i.e. on the shelf? …before microbial activity sets in? Are there ways of preserving it, assumming one wants to package for commercial purposes. Mine never lasts more than a week in our house. I made this granola for a second time within 10 days. It fits even my vegan daughter’s lifestyle and she stole half of the first batch. It is incredibly delicious. The only change I made was in using sliced almonds instead of whole because I like it like a cereal and sliced are better size, IMO. Anything else is just perfect! Thank you! the flavor combination is perfect. Just want to say Thank You! This recipe is fantastic. I love it and my husband loves it and he is a granola fiend. 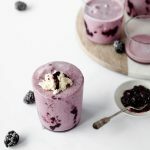 I’ve been working over time to get him on the no sugar, no grains bandwagon and this recipe is huge help. I just made a batch and loved it! I have made other low carb granola in the past and I ended up adding one egg to the mixture – I think it helps to give a little more crunch to the nuts. I also added this information into My Fitness Pal and weighed the batch. My batch made about 22 oz. and after inputting the recipe into My Fitness Pal, it shows almost double the nutrient values as yours does. I will make it again, though! Just came across this recipe a few months ago. I love it! Thank you for posting. It’s amazing how much you can crave something you never really cared for when you change your diet. 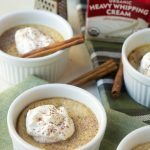 I never cared for cereal but when I went Keto, suddenly I started craving it. This definitely satisfies. This is a lifesaver for me as I have an auto immune disease that I have to be sugar, gluten, grain, dairy and soy free. Along with a good sensitive to eggs. Breakfast was my hardest meal to come up with something. I believe I found my go to recipe!!! Thank you!!!!! We just made this last night and it tastes amazing! We originally made it for my dad who is on a low-carb diet, but now the whole family is eating it! I inadvertently came up with a variation on this wonderful recipe. About halfway through I tasted the mixture after stirring and decided that I’d like some additional cinnamon, so I grabbed the jar and shook some into the pot. But… it wasn’t cinnamon – it was Penzey’s Arizona seasoning. After screaming a few choice words I tasted it again and found that I had accidentally made a sweet, smokey granola with a mild kick. It’s actually pretty good! LOL! Glad it still worked out for you! Can I make this in a 2 quart? This is the best recipe I have come across in ages. I love it as a snack and it is fabulous as a cereal. Super easy to make substitutions and additions. Thank you. Would love to try this, just curious though, how much is an actual serving? One cup? A half cup? It doesnt say.